Roll; it's your turn. Game Night 2018! Two of my favorite things: Instructurecon and boardgames. When I was a kid, my cousins from New Hampshire came down to Massachusetts for Thanksgiving and would stay over at my parents’ house with us for the long weekend to hang out with me and my brother. We’d stay up all night eating leftovers and playing board games. We spread out across the kitchen and dining room for cutthroat Monopoly marathons, painfully aggressive Parcheesi tournaments, and brutal Backgammon duels that are still talked about now, decades later. Today, myself and a fluctuating group of friends dating back to high school, get together for boardgames following Thanksgiving day activities. The list of games has changed tremendously; instead of Monopoly we play Splendor; instead of Parcheesi, it’s Settlers of Catan; and two-player Backgammon has made way for group strategy games like Pandemic, Wits n’ Wagers, and Mysterium. When I started working at Instructure, I was thrilled to find a community of gamers among employees and customers. A "game night" seemed like a natural fit for Instructurecon, so the idea was pitched, accepted and, since the launch of Game Night at Instcon ’15, it has become an annual favorite. Game Night 2017 at Warren Station in River Run Village. Photo by post author. YES! you are welcome to bring your own!! We cannot provide storage, however, so plan to carry it with you to/from the event. Woot! Game night lives again! I think I'm going to try to bring Dominion this time, though I'm looking forward to 7 Wonders and maybe trying Splendor. Of course Carcassonne is always fun... ...gonna be a long night! Spendor is fantastic! There's a relatively new expansion (released in 2017) that contain four separate smaller expansions that can be added to the game. The rules are pretty easy to learn! One of my favorites! Thank you, Tracey DeLillo for mentioning Game Night in your blog post and for adding it to your conference agenda! Also, very very glad your chancellor approved. Hey, that story is 100% true. He was like "Game night????". LOL. Just a quick update re location --- We're looking to get Game Night set up in the same building as the kickoff keynote, dinner and opening party so you won't have to go far between the events. The location has changed each year at Keystone as we aim to find the best/most logical place to game. We're not intentionally trying to make Finding Game Night a game in itself; we're just trying to find the best place. Just wanted to give you the heads-up because I know you are all planning your activity calendars down to the last minute. This is quite tempting and I may have to join. I love playing tabletop games and have played all of the ones listed above. It can help make up for missing my normal family game night on that Tues night as well. Please come by! - stop in, check it out, play a round or two, or stay all night! Maybe Linda J. Lee can come play this one with me in the spirit of folklore and fairy tales! When I attended InstructureCon a couple years ago, I recall people playing "7 Wonders", so I'm quite certain that card games are perfectly acceptable, Laura Gibbs. p.s. "Lanterns" is a great game! I even have the expansion and a couple promo tiles. Yes, Love Letter, too, is a card game. Thanks, Laura Gibbs for bringing a new game to share and teach! Count me in, Laura Gibbs! I love just about every flavor/expansion of Carcassonne, but Carcassonne: South Seas (which I won in a Carcassonne tournament a few years ago) might just be my favorite! I'll try to bring a few card games with me -- perhaps Fluxx, Aquarius, and Bohnanza. Or maybe Once Upon a Time (and the Dark Tales expansion). Ooo! Game night! Sweet Jesus I'm excited now Since I'm driving out I'll probably bring Scythe along with me. Anyone else into a steampunk 1920s Europa factory building/resource management game? It's quickly become a favorite of mine. woah - impressive playing field there. i'm in for a round! I've got Scythe, both expansions, the board expansion to make things larger, and several of the promo cards. Unfortunately, it hasn't made it to my table yet. 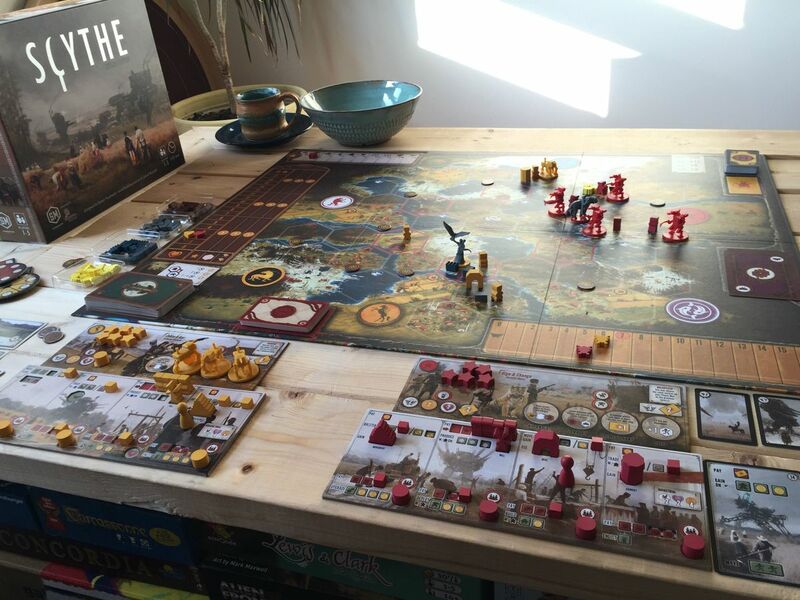 I own Scythe but have only played it once. I'd love to get another game in! Very excited about Game Night! Good to see that a lot of games will already be represented here too. I'm flying in so I won't have a lot of room, but I wanted to bring 1 or 2 games just in case. I'm thinking Race for the Galaxy for sure... and maybe Great Western Trail? EDIT: Just Race for the Galaxy... gotta make sure I have room for swag! But with all the other games mentioned, we'll have plenty to keep us busy! Both sound good! You are an excellent table master - you lead a great game. So glad you will be there! I'll be there! I'm planning on bringing Azul, Kingdomino, Rock Paper Wizard and Millennium Blades. Rogue Game Night! A couple of people have floated the idea of another night to play games. and after chatting with some of the attendees, we have a few that agree! So, I'd like to see if we can gather some interest in a off-the-record game night. Here's my thoughts: Thursday, July 27, anyone interested can get together for games. Let's set the meeting time at 8:30 pm to give people time to enjoy the Thursday evening events. For location, we can either meet near the fireplace by the registration booth in the conference center, OR we could meet in the Big Horn Lounge across the street as I'm not sure if the conference center will be open tomorrow night. I will try to check with the staff to see what the evening timeline is. We have several people interested in a game of Captain Sonar, but we can certainly bring other games as well. Race for the Galaxy and Glory to Rome may be on tap. Please let me know if anyone's interested and if there are any suggestions on location! Ok, after some inquiring, found out that the conference center closes at 10, which doesn't give us a bunch of time and sounds like a hard limit. I'm going to propose that we try to have some games at the Big Horn Lounge within the Keystone Lodge. The bar there closes at 10ish but we should be good to stick around for a bit. If some of us make sure to patronize the bar, there are some tables we may be able to use and push together as long as it's not too busy. I did check out the space and we won't have as much table space as we did during official Game Night, so we should aim to bring games that take up less real estate if possible. Here are a few photos I took on Tuesday evening during Game Night. I got to play two games of Splendor (see below). Thanks for organizing this, Carrie Saarinen! It was fun! The group of six seated at the table on the right was playing a game on their mobile devices called "Spaceteam". My winning hand of 7 cards to score the needed 15 points to win the second game of Splendor. Hey there, gaming friends! Hope you've been able to get some games to your table since InstructureCon 2018. I don't know if you visit the Miniature Market website much, but they have a big sale going on right now with more to come on Thanksgiving. I've picked up a few things already, and they are on their way to my doorstep. There's also a list you can download which shows the stuff that's on sale as well as the stuff that will be on sale for Thanksgiving. Enjoy, and game on! Re: #solopandas live again at InstCon18!